The Canadian ELD implementation process is expected to start this year. While final confirmation is not yet available, Canadian Transportation Authorities have indicated that it will closely follow the ELD implementation process used in the U.S. This is good news for Canadian carriers who already run cross-border businesses. Canadian ELD rules will apply to motor carriers, commercial truck and bus drivers. Transport Canada shares generally the same reasons for introducing ELDs as the U.S. Federal Motor Carrier Safety Administrations (FMCSA.) It has outlined its plans via the Regulations Amending the Commercial Vehicle Drivers Hours of Service Regulations (Electronic Devices and Other Amendments). ELDs help to bring about safer roads and prevent fatigue amongst drivers—a consistent danger to fleets. The government says “commercial motor vehicle drivers are particularly at risk because of the monotonous nature of their work, extended work days, irregular schedules and poor sleep hygiene. The regulations are intended to help normalize the driver’s natural sleep rhythms and to provide opportunities for daily rest to help drivers recover from the effects of fatigue while accommodating the efficient and economic movement of goods and passengers.” Canadian ELD are being implemented to increase driver safety and well being. Other benefits outlined in the document include fairer competition for carriers, better cross-border relations with U.S. regulatory requirements, proper compliance with HOS rules and better quality of life for drivers. Canadian vs. U.S. ELD: What’s the difference? Many fleets already have experience with ELD compliance. With nearly 80 Canada-U.S. truck crossing points, fleets have adjusted to the cross-border process. The Canadian ELD will help to ensure this cross-border consistency continues. When drivers can seamlessly move across the borders, goods can do the same. The Canadian mandate is set to apply to trucks manufactured in 1995 or after. The U.S. rule applies to trucks from 2000 or newer. Law enforcement sharing will differ. In Canada drivers must display driving information to officials, but not at the same level of detail as is required in the U.S. This is because Canada measures in a different way, through Cycles. Canadian ELD mandate will require a change in status in personal conveyance if a driver goes beyond a 75km measurement within a 24-hour period. The U.S. ELD has different requirements. It is expected that the introduction of ELD in Canada will mirror the timeline of the process in the U.S. There, the FMCSA published the rule in 2015, with a phase-in compliance from December 2017. 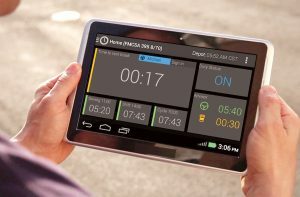 The phase-in process sees the mandatory use of ELDs with existing AOBRDs grandfathered for two years. ELDs will be mandatory by December 2019. In Canada, motor carriers and drivers will have two years to prepare for the implementation of ELDs. This gives carriers the time to select and install ELDs and train their drivers in how to use them. Within those two years of transition, drivers and carriers will be exempt from compliance with the new ELD provisions. After the two-year transition period, full compliance will be required. The precise timeline for the introduction of the Canadian ELD is still under review. It is expected that the timeline will be like that of the introduction of ELDs in the U.S., with a public comment period, publication, compliance date and end of a grandfather clause. We anticipate updates in the coming weeks. Until then, talk to ORBCOMM about our ELD products and find out how they can help your fleet be prepared for Canadian ELD.